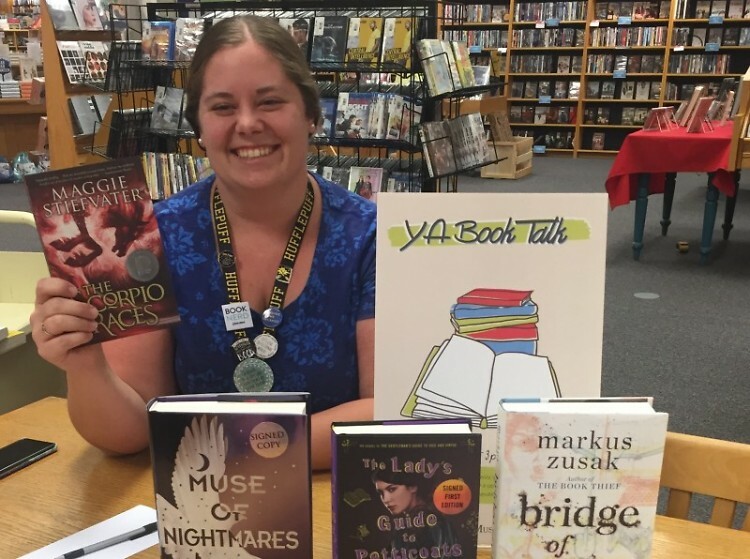 The YA Talk at Schuler Books on 28th Street is an opportunity for readers of all ages to gather and talk about their favorite young adult books. Want to check it out? The group meets every month on the second Saturday at 3 pm, at Schuler Books & Music on 28th Street. Every second Saturday of the month, a group gathers around a cluster of tables in the Community Area of Schuler Books & Music to talk about their favorite Young Adult books. The YA Talk is hosted by Meghan Vanderlee, a bookseller at Schuler books, and an accomplished book blogger on Instagram. After she had the idea, she asked some of the teen reviewers—teens who can check out advanced copies of books in exchange for a review— if they would enjoy coming in to talk about what they’d read. Of course they would like chatting with other people about the books they’re reading, they said, and they had friends who would come too. Soon, Vanderlee had spread the word among customers shopping in the section, and set up the book talk as an official Schuler’s event with the help of Caleb Lawson, the store’s graphic designer. Schuler Books & Music, established in 1982 by Bill and Cecille Fehsenfeld, has long been known as the local bookstore of Southern Michigan, though most just refer to it simply as “Schuler’s.” One of the store’s main goals is to remain local and independent, as they only have two locations, the other being in Lansing, and a sister store in Ann Arbor, Nicola’s Books. The 28th Street store’s staff enjoy being a part of the community, and host many community events such as visiting authors, local author nights, and numerous reading and knitting clubs. The YA talk is the latest addition to these groups, and has hosted numerous readers of all ages. Popular opinion is that the Young Adult section in bookstores is only for teenagers, but this talk and its participants are here to tell you differently. People read stories to escape, or to find parts of themselves in the characters on the page. The main characters in Young Adult novels may be teens, but their journeys reflect a change in themselves and their world. Another aspect that draws readers to these books is the fact that the characters are usually rebelling against a patriarchy or a similar force of society that’s working to keep them down. Of course, for many teens, this is an enticing plot, as they may feel they’re held back by their parents or the limitations of their community. At the talk, Vanderlee guides discussion by introducing latest releases and asking what everyone’s read lately, though soon the discussion leads itself and excited chatter bounces around the table. During the October meeting, one of the discussions revolved around the book “The Hate You Give” by Angie Thomas, a popular and timely novel that’s recently been made into a movie. “The Hate You Give” follows a young teen named Starr as she deals with the death of a friend, a black teen, at the hands of a police officer. She finds power, love and understanding in her community, and the reader is called to think on these issues. Soon, everyone was talking about similar books and their own experiences, and a community had been created around the discussion of the story. Towards the end of the talk Vanderlee introduces some advanced reader copies of books she has in stock. These are books sent by the publishers to the bookstore, so that people can read them before release and write reviews. Each participant in the talk can take a book home with them if they would like, and many choose to. As well as advanced copies of books, lovers of YA novels will be delighted with the constant Harry Potter display, and the YA merchandise Vanderlee has on display at the back desk. The back desk, in the Music section, is also where the teen reviews are posted, and the spot is growing, as more teens come to the talk and become involved in the program. 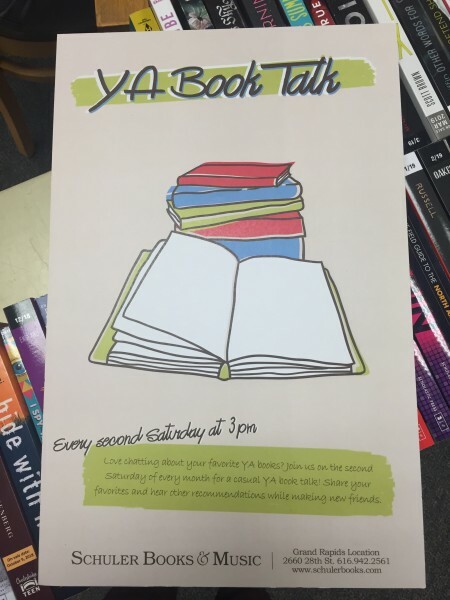 The YA talk meets on the second Saturday of each month at 3 p.m. and goes on for an hour or two, sometimes longer if the conversation continues. There’s no need to RSVP, readers are welcomed to come say hi and chat about their favorite books whenever they’d like. For more information on the talk and other Schuler events, you can visit Schuler's website.